Tourism entrepreneur Karna Shakya, who is also promoter of the ‘positive thinking’ campaign, is among those putting up mega structures within the wetland area. Shakya runs the Water Front Hotel there. POKHARA, Aug 3: It may surprise many that land at famous Fewa Lake in Pokhara has been registered for years in the names of private individuals. It has been learnt that land around the lake, which is listed as a Ramsar wetland conservation area, has been registered as private property and the area of the lake also shrunk from 10 square kilometers in 1961 to 4.20 square kilometers in 2008. Locals said some individuals cunningly registered land around the lake in their names during the first government land survey carried out in 1977. But the government appeared indifferent about this apparent case of public land encroachment. A government committee submitted its report on the encroached Fewa land some four years ago, but the report has not been implemented so far. Meanwhile, construction activity around about the encroached land has become rampant. The then Baburam Bhatttarai government had formed the committee in 2012 under the leadership of Biswa Prakash Lamichhane and assigned it the task of tracing the encroached land. The committee recommended scrapping the land ownership certificates of as many as 950 individuals involved. Lamichhane said about 700 individuals were found to be in possession of land inside the wetland conservation area. He believes the land should be returned to the government. “Structures built in the wetland have posed a further risk to the lake,” he added. The Lamechhane committee found that various individuals had encroached upon a total of 860,975.8 square meters in the conservation area. Although plots of land are normally not demarcated in straight lines, the plots in the encroached area at Fewa have been carved up straight, said Lamichhane. “The report has not been implemented even after four years. We had mentioned details of the land ownership to be scrapped, including names of owners and plot numbers,” he said. 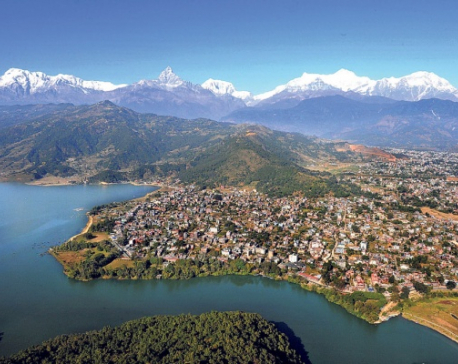 Mayor of Pokhara-Lekhnath Metropolitan City Man Bahadur GC said he is wary of the rampant encroachments as this will pose a risk to the lake. “The lake has shrunk to 5.09 square kilometers from its original 11.2 sq km. The metropolitan city is committed to conserving the lake and tracking down the encroached plots and the individuals doing the encroaching,” said Mayor GC. GC said the metropolitan city has been studying the land surveys from different times. The committee has suggested providing 0.27 sq km as compensation to the owners, who have been paying tax since 1933. Likewise, the committee suggested providing compensation for 0.08 sq km of land in the wetland conservation area. Experts have said that the depth of the lake is also decreasing, and it is now 18 meters, down from 33 meters during the previous survey held in 1974. The report states that the lake could see maximum shrinkage in 75 to 100 years if the agency concerned failed to pay proper attention to its conservation. The issue of land encroachment at Fewa Lake has not been limited to the probe panel. Locals in Pokhara have been making various complaints at various government bodies. Separate complaints were filed at the Ministry of Federal Affairs and Local Development and the public complaints hotline Hello Sarkar a few months ago. 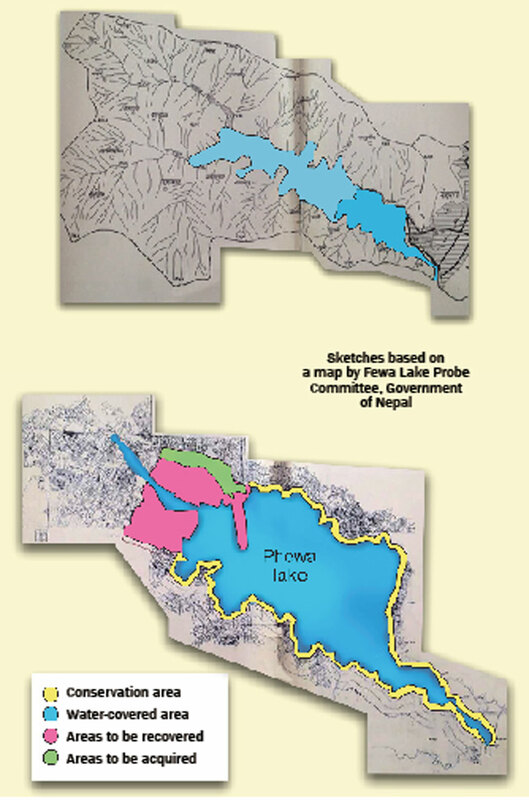 Responding to the complaints, authorities in Pokhara wrote to MoFALD on June 28 that they had established a separate Fewa Lake Protection and Conservation Office to conserve and manage Phewa Lake. However, plans to demarcate the lake and retrieve encroached land were halted as a writ petition over the matter was filed at the Supreme Court, the metropolitan city said. 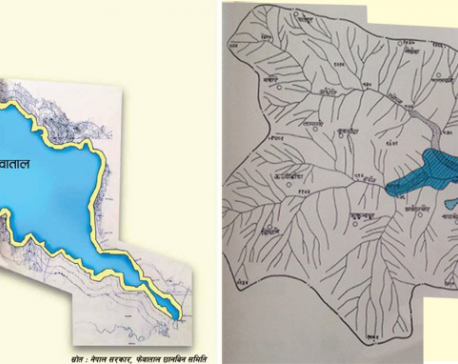 The letter sent by then officiating Executive Director Om Raj Paudel said individual land owners on the shores of the lake have carried out construction work even though the metropolitan city has a clear policy of not allowng any construction within 65 meters of the edge of the lake. The letter said plans to restrict construction failed as those who have land registered in their names have demanded compensation. The metropolitan office has even written to the National Planning Commission (NPC) to help arrange funds to provide compensation to the individual land owners.